Having been recently reminded (thank-you anonymous!) that I usually put up a bit of a competition at this time of the year, I have put a little collage of puzzley pics together for your festive amusement. 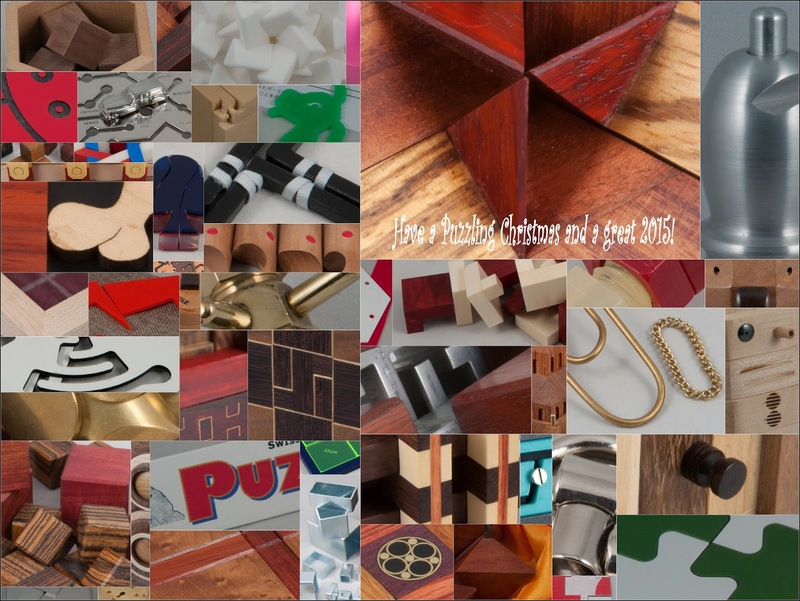 I think there are 50 recognisable puzzles in the collage, mostly featured on my blog, although some haven't... but if you're a serious puzzlist, you'll recognise them too! My email address is my firstname dot surname at gmail dot com. to all my puzzling mates around the world! Brian Pletcher, the original puzzling super-blogger, has been jolly industrious recently. 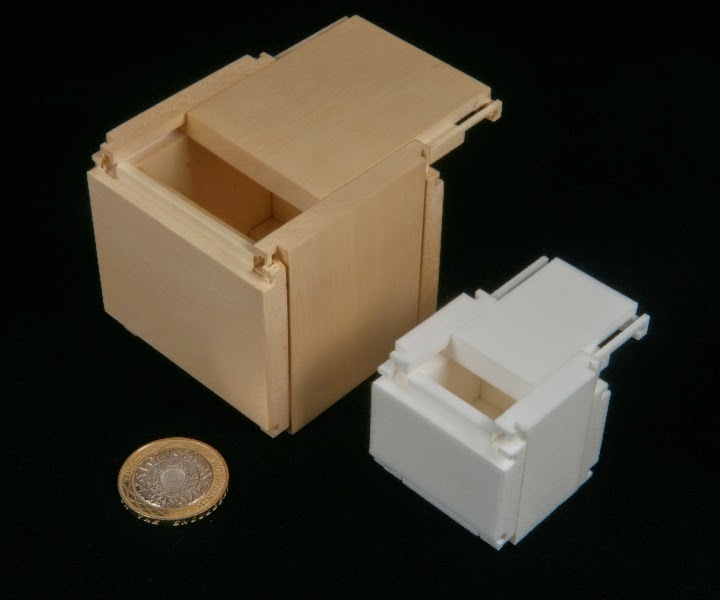 He challenged himself to produce 3D printed versions of a pair of Robert Yarger’s iconic puzzleboxes. You can read his story over here. A couple of my mates had bought copies of the Borg Box from Brian and some of the guys on the puzzle forums were raving about them. I’d pretty much decided to get myself one when George Bell put up a photo of his colourfully dyed copy and that absolutely sealed it for me … and with the looming Shapeways price increases I managed to squeeze in an order just before they virtually doubled in price. Brian being a rather generous soul ended up tossing in a free copy of his version of the Snowflake as well and a couple of weeks later a pair of rather stunning little reproductions arrived in Barnt Green. Now in the interim, my mate Adin (the origami-guru and designer of evil exchange puzzles) had also bagged copy from Brian and was planning on dying it so it wouldn’t be plain Shapeways white (albeit strong and flexible!). Thinking that tossing an extra set of pieces in the pot wouldn’t be a lot of extra bother, I asked if he’d mind adding mine to the brew and he readily agreed…. Only, a few days later he’d put up some pics of his copy resplendent in glorious Technicolor and I hadn’t even dropped my white bits off at his place yet… so much for not much extra bother. Long story short, Adin merrily dyed my copy a couple of weeks later and then dropped off a set of colour-coded bags of bits when he and Sophie came round for a day’s puzzling… along with a few other puzzlers. So while Adin and Chris were both still there, I tipped all the bits onto the dining room table and set about trying to work out how the heck to put this puzzle together – remember Stickman himself charges a hefty assembly fee to anyone who takes their full-size copy apart and can’t get it back together again themselves. I was faced with a pile of scrambled bits – and even with the full-size copy next to me for inspiration (and reference) I really struggled to even start to see how it went together… With a lot of encouragement and advice from Chris, I managed to make a bit of a start but we had to call on Adin for some help once we had the panels more or less together... at which point we realised some of the locking mechanisms needed to be reversed in order to get the panels to actually go together. It must have taken well over an hour to finally get the little marvel assembled and locked up… so now whenever anyone opens my Borg Box, they will find a rather colourful little 3D-printed miniature version inside it… :-) ...and when they open that copy... it's empty... but wouldn't that be pretty cool... turtles! …and since Brian had sent me a copy of Snowflake as well, and it just so happens to fit perfectly inside my Snowball, anyone opening my copy of the Snowball will find a neatly nesting copy of Snowflake inside that as well! Thanks to Brian to letting me get a copy before Shapeways’ prices went skywards and for tossing in the Snowflake as well – and a huge THANK YOU to Adin for boiling some colour into my little Borg Box – it looks brilliant! 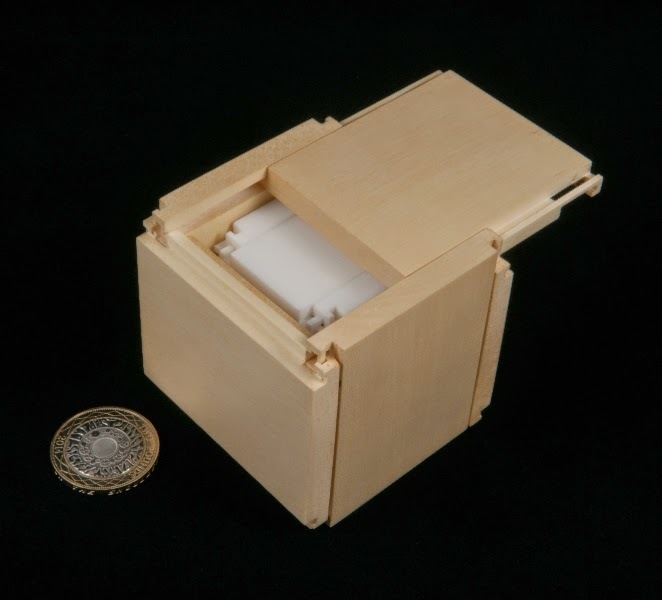 A copy of the Stickman puzzlebox #2, the 55-move box, that is. I’ve been slowly adding to my little collection of Stickman boxes over the past few years and it’s fair to say that this one has held a fair amount of attraction – and after watching a couple of them go for some very healthy prices, I was delighted when the latest one to hit Jacques Haubrich’s puzzle auction didn’t get quite as spendy as the others… so it ended up winging it way across the Channel to Barnt Green. A large part of the draw for this puzzle came from its looks on the one hand and Neil’s description of it over here. Any box where the opening sequence gets described as having a rhythm, and a rhythm akin to a classic Led Zeppelin track at that, can’t be bad. If it’s not immediately obvious from the numbering, this is one of Robert Yarger’s early designs… he’d produced a couple of designs that hadn’t been given design numbers and when he started seriously making puzzleboxes, he began numbering the designs… so this is only the second design since he started taking the whole puzzle-box-making-malarkey seriously … and it deserves a huge amount of respect! 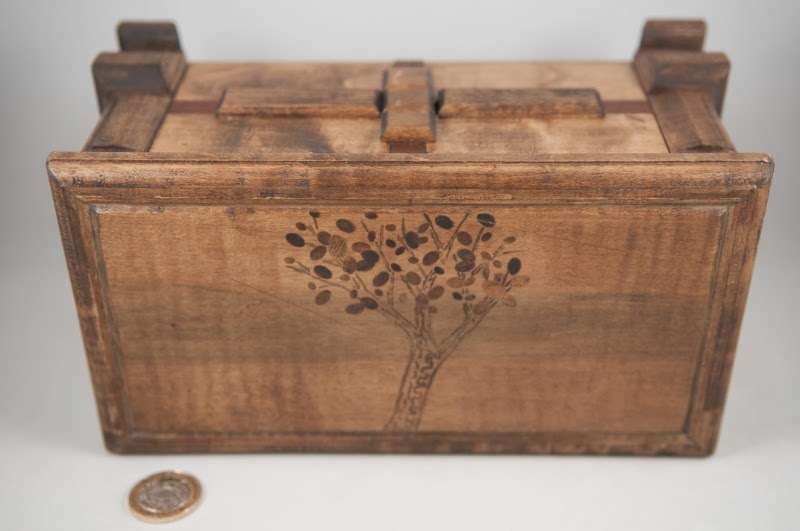 From Rob’s own description over here he only possessed a radial arm saw, a drill and some hand tools at the time that he made 45 of these boxes – out of scrap wood! 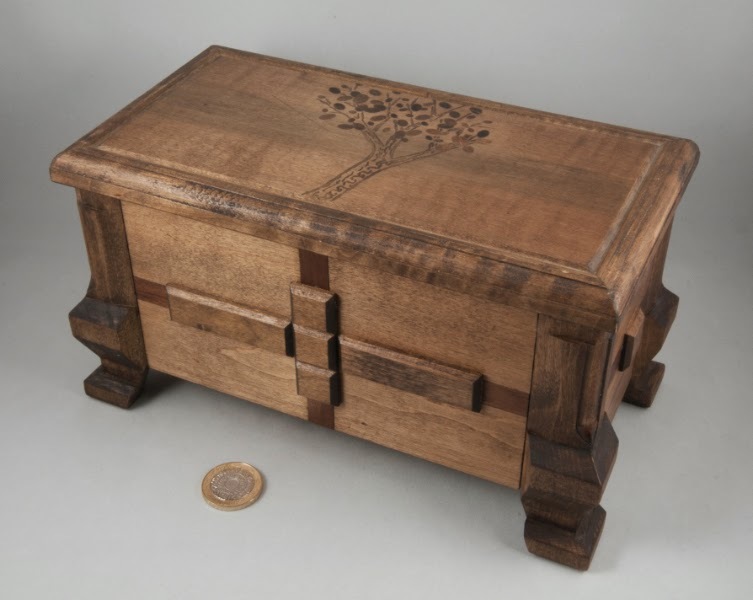 Rob humbly describes them as looking a bit rustic, and they may, but mechanically this is a fantastic puzzlebox! First off, going straight for the obvious lid of the box provides a little surprise: either it’s locked or there’s another way in… or a bit of both. 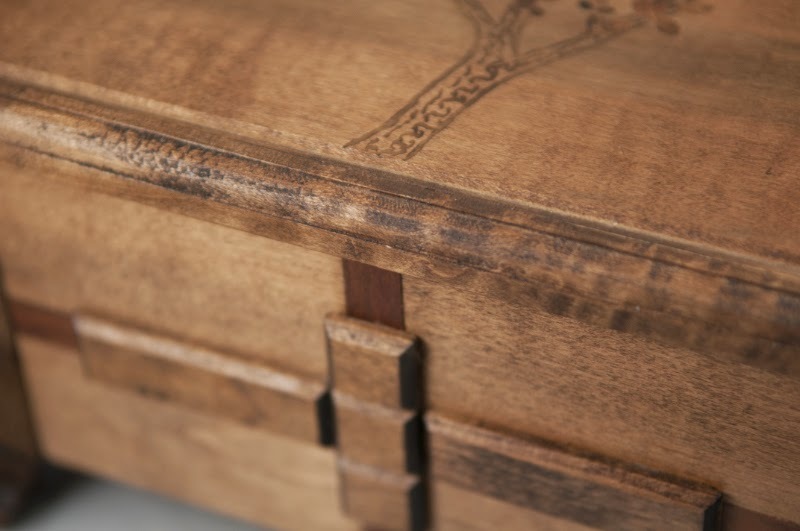 This is not your average little decorative chest – the decorative bits tend to hide handy puzzly bits and when you start solving this box you realise just why it’s so darn popular among collectors around the world. The first few steps are reasonably predictable, but then Rob throws in a massive curve-ball! Once you get over that bombshell, you settle into the rhythm that Neil talks about and it is delightful – there’s a clear purpose to each move and once you get a mental picture of what you’re doing you can settle into that rhythm and watch things unfold in front of you. The next two come along fairly quickly, just like the proverbial London bus… but you have to work for the next one – which rewards you when you’ve realised why things worked the way they did earlier on in the process. 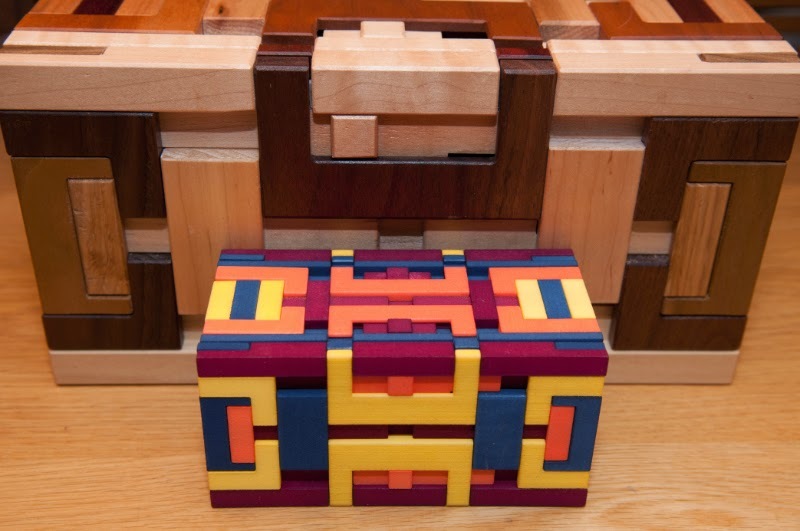 There’s a really good reason why 55-move Stickman puzzleboxes don’t come up for sale very often – puzzle collectors simply don’t want to part with them – because they’re brilliant! 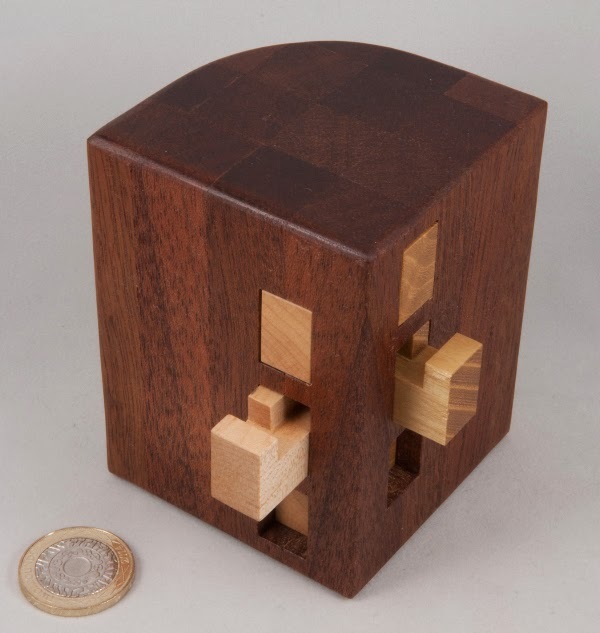 This rather interesting puzzle first appeared at this year’s Nob Yoshigahara Puzzle Design Competition. 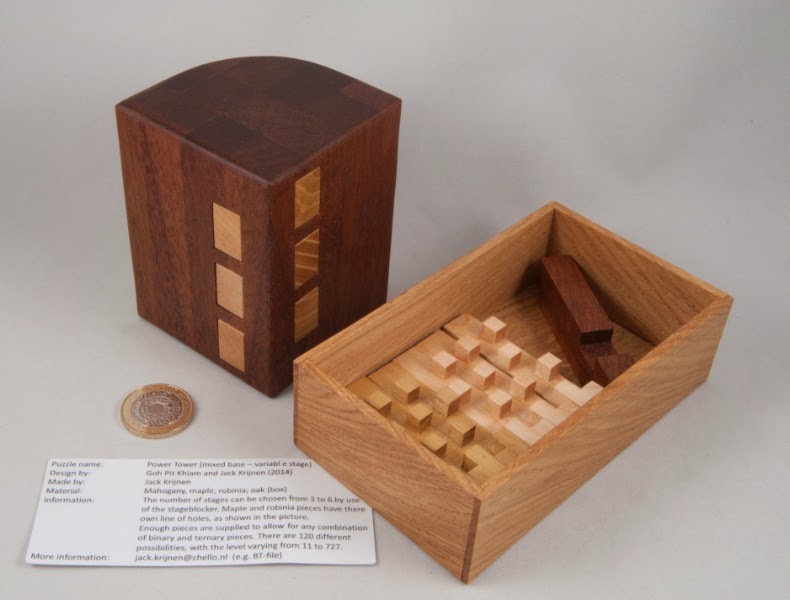 Designed jointly by Goh Pit Khiam and Jack Krijnen, the competition entry had four interfering sliders to produce a new incarnation of n-ary puzzle. 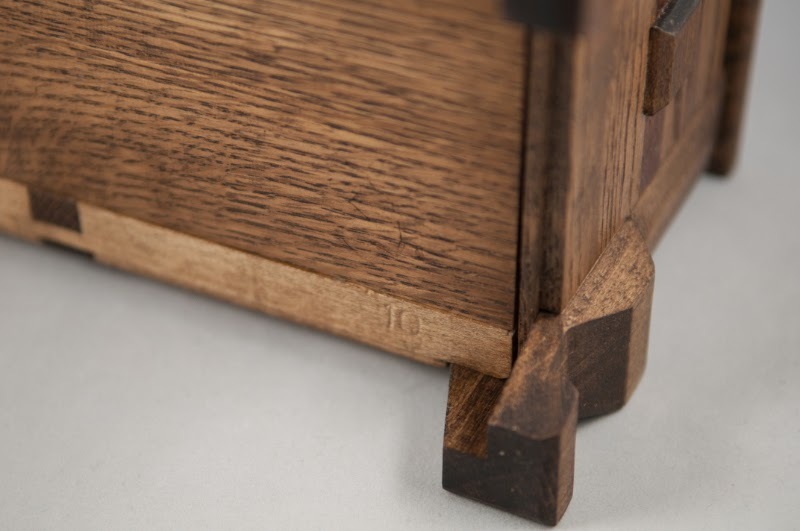 The rounding across one of the corners produces a great lump of puzzle that fits easily in the hands and makes operating the sliders quite comfortable. Sadly I didn’t get to spend much time in the competition room at IPP34 and apart from a cursory fiddle, didn’t get to enjoy this puzzle at all … so when Jack mentioned he’d made a couple of copies I registered my strong interest and managed to collect a copy from him at DCD in October… only the new version is a serious development on the competition entry – the International Space Station compared to a Sputnik, so to speak. At first glance it looks as though Jack’s just given it a couple of extra sliders, which would have been nice on its own… but he’s gone and done a lot more than that! He’s introduced an optional magnetic stageblocker piece that can be used to block off one of the last three channels – pop this piece in place and you can select to have either three, four, five or six sliders in play… I don’t need to tell you what that means for move counts! Again, that little addition would have been pretty darn nifty! To give it its full name, this is the mixed base, variable stage Power Tower. 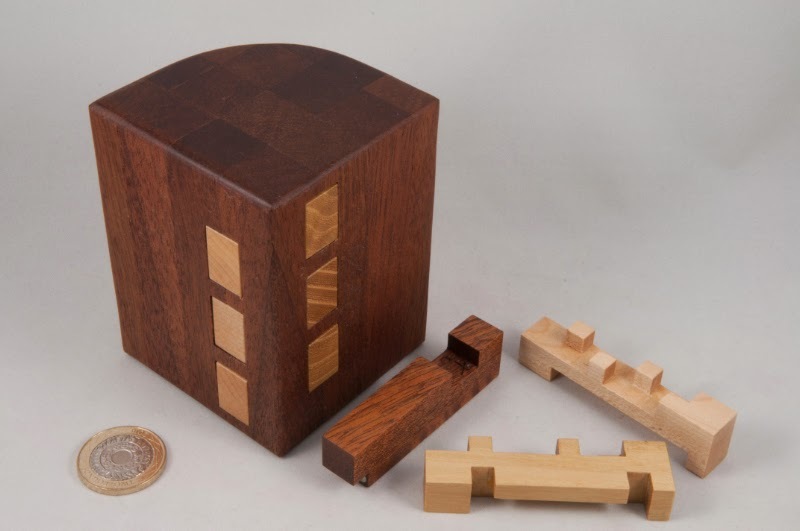 It is a great idea that’s been brilliantly developed to the limit to provide a super little tormentor’s puzzler’s kit for experimenting with n-ary puzzles. It’ll give you 120 different configurations and anything from 11 to 727 moves. 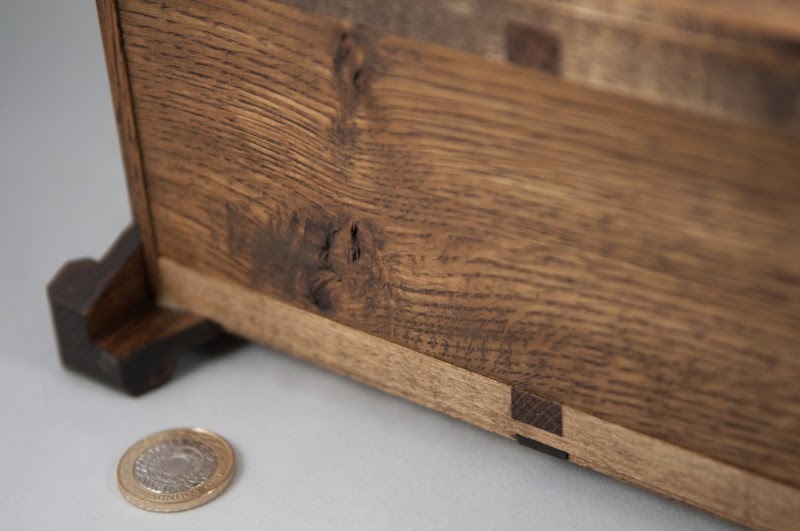 It goes without saying that Jack’s handiwork is simply superb, yet again, and he’s produced a puzzle that’s an absolute delight to fiddle with. Thanks Jack and congrats to you and Pit Khiam on the design – elegant and clever! ...and if you'd like to read more - there's a great article in the latest edition of CFF from Pit Khiam on The Design of N-ary Mechanical Puzzles... which features the development of the Power Tower.